Owing to the lack of a standard nomenclature across various manufacturers, description of surgical instrumentation remains nebulous among surgeons, surgical staff, and trainees of all levels. 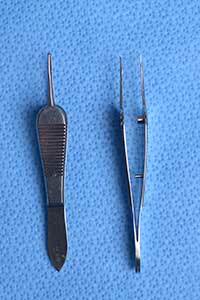 The instruments discussed below are found in all surgical trays used for oculofacial plastic surgery at the University of Iowa. 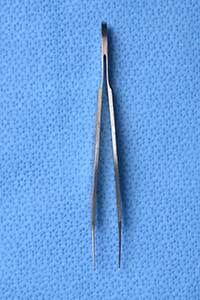 These forceps have teeth set at right angles and are designed for grasping skin. They are used to grasp thick/heavy skin such as brow skin when performing a pre-trichial or direct browplasty. 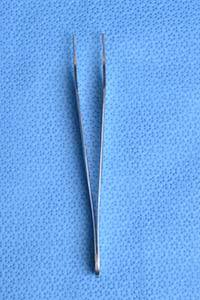 Brown Adson Tissue Forceps 4.75"
These forceps have a wide, flat and serrated platform for thumb grasping. In addition, they have multiple rows of teeth at a right-angle, making them suitable for holding and manipulating subcutaneous tissue. As with the Adson Tissue Forceps above, they are used most frequently during browplasty to grasp thicker/heavier tissues of the deep brow. These forceps have forward angled teeth and a wide serrated handle. They are versatile and have multiple applications including grasping delicate periocular tissues such as the eyelid skin during blepharoplasty and brow skin during browplasty. These forceps feature forward-angled teeth of various sizes which allows for grasping and manipulating tissues with greater ease. 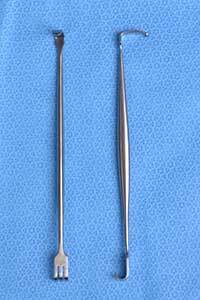 The handle is flat, and the forceps are straight with the tips forming the distal working end. 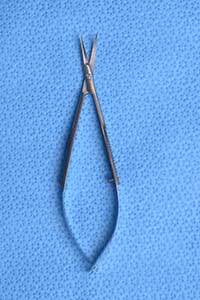 These forceps are frequently used to work with finer tissue such as the conjunctiva or the eyelid skin during blepharoplasty. Bard-Parker Knife Handle #9 4.25"
This handle has similar application to the one above but lacks a protective sheath for the blade. Metzenbaum Dissecting Scissors Curved 5.5"
These scissors have blunted tips and are designed for both cutting delicate tissue and for blunt tissue dissection. They are not recommended for cutting sutures, drains, or heavy tissue. The Metzenbaum scissors are similar to Mayo scissors but are lighter with a more slender midsection which improves their utility in tighter operating fields. 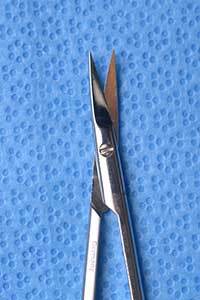 Often these scissors are used to release the conjoint tendon via browplasty incisions placed at, or behind, the hairline. Storz Iris Scissors Curved Small 3.25"
These multi-utility scissors have a variety of oculoplastic uses including trimming skin and fashioning lateral tarsal strips. These are also sometimes referred to as 3397s. 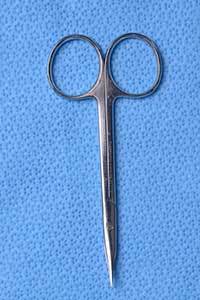 Stevens Tenotomy Scissors Curved 4.5"
Tenotomy scissors have characteristically long handles and small, sharp blades with sharp or blunt wedge-shaped tips. They are used for dissection and cutting. The long handles provide the surgeon with a firm grip and control while operating in narrow areas. 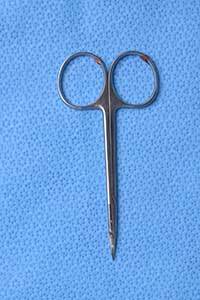 Stevens Tenotomy Scissors are commonly used to dissect into the four periocular quadrants in an enucleation. These versatile spring-handle thumb scissors are designed for cutting delicate tissues, and come in both blunt and sharp-tip forms. 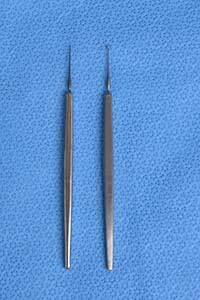 They are the workhorse in eyelid surgery and are commonly used for both blunt and sharp dissection. Examples of their use include in the opening of the orbital septum in procedures such as levator advancements and upper eyelid blepharoplasty with fat removal. 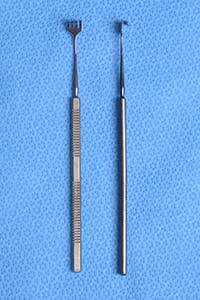 Needle holders are designed to grasp, hold, and maneuver surgical needles. 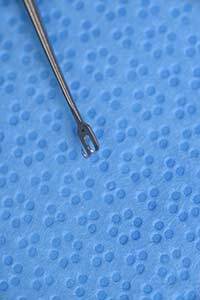 Most needle holders feature a clamp mechanism to lock the needle in place. To maintain a firm grip on the needle, the jaws can be textured and short when compared to the handles. 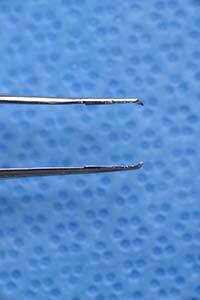 Smooth jaws cause less damage to the needle while serrated jaws allow for a firmer grasp of the needle. Castroviejo Delicate Straight Needle Holder with Lock 5.625"
Available in various sizes, the locking system on this needle holder ensures a firm grasp of the needle. It is used to pass most needles in oculoplastic procedures, including tagging of the extraocular muscles during enucleation and closing a blepharoplasty incision. 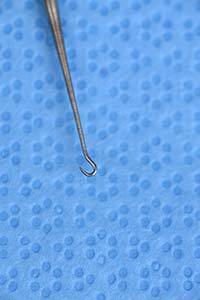 The tying platform allows for grasping of the needle during reloading or for grasping of suture while tying. 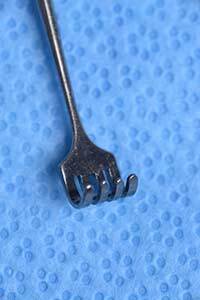 Additionally, the design of the handle allows for improved flexibility and mobility as the surgeon can easily rotate it within his or her hand. 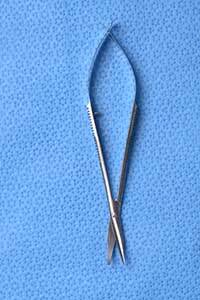 This ring-handle needle holder is used when significant force is needed to pass a needle or when long/deep passes are made through sub-cutaneous tissues. Often a larger needle, which is at risk for popping off the Castroviejo, is used for these passes. 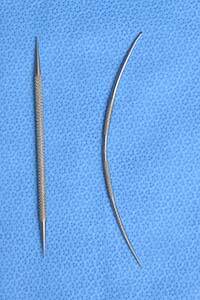 The brow fixation during posterior hairline browplasty is placed using the Webster Needle Holder. They are available with smoother or serrated jaws. 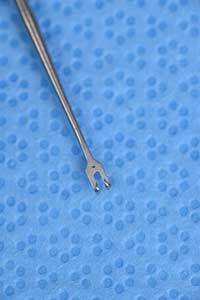 Tyrell Iris Sharp Hook 4.75"
This small, single-pronged hook is used for retraction, dissection, and removal of tissues. 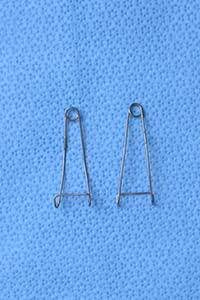 These hooks are used when undermining thin skin such as during direct closure of an eyelid laceration or for manipulation of the lacrimal sac and nasal mucosa flaps in dacryocystorhinostomy. 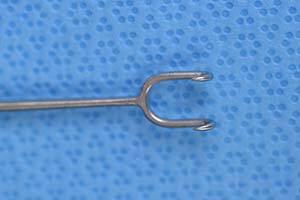 This small, double-pronged hook is used for holding and retracting the edges of skin during surgery. 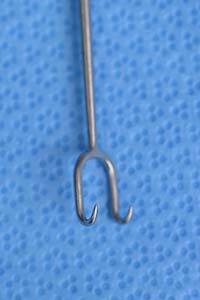 This skin hook of choice for retracting eyelid skin prevents crushing that would otherwise be caused by the use of forceps. 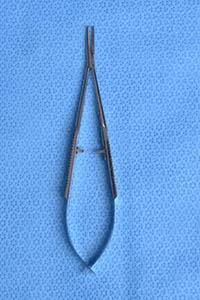 This retractor is larger in size and is often used for elevating thicker tissues while minimizing crush damage. For example it is used to retract the forehead tissues during a pre-trichial dissection. 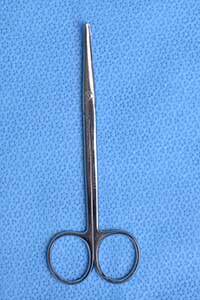 Knapp Lacrimal Sac Angled 4 Prong Blunt Retractor 5.5"
This retractor resembles a small rake with its four wide, blunt prongs. It is helpful in tight spaces such as the medial canthus/lacrimal sac. Examples of its use include when removing the medial fat pad during blepharoplasty and when performing transcaruncular dissection. Senn Double Ended 3 Prong Sharp Retractor 6.25"
These retractors are made from malleable stainless steel, allowing for easy modification of retractor angle and shape. 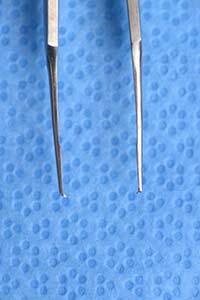 The blades are available in a variety of sizes depending on the surgeon's need and are commonly used during orbital dissection to keep orbital fat out of the surgical field. This large instrument has a concave and a convex surface which serve to complement the contour of the globe and allow for its placement between the lid and the globe during eyelid surgery. It provides a rigid surface on which lid dissection can be safely performed while protecting the globe. 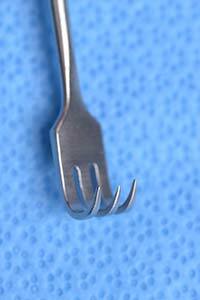 This plate is commonly used for this purpose when harvesting a Hughes flap. 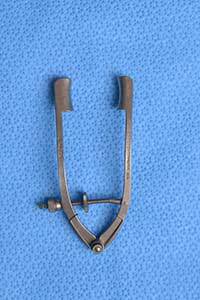 It resembles a shoehorn and for this reason is also commonly called a "shoehorn retractor". 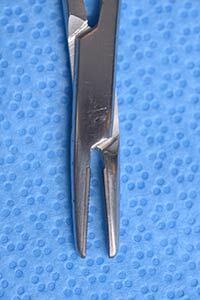 This is a rigid speculum which allows for adjusting of the width of the palpebral fissure. In addition, it has guards to keep the eyelashes away during surgery although this can also be accomplished with the use of surgical drapes. A possible disadvantage of this speculum is that it can create significant force on the eyelids which may increase the rate of post-operative ptosis or other eyelid malpositions. This speculum is designed to pull the lid back with a secure hold to expose the anterior aspect of the globe. The Jaffe lid retractors come in a set of two which allows for simultaneous upper and lower lid retraction. They can be anchored to surgical drapes using rubber bands and hemostat clamps to effectively keep the eyelids out of the surgical field. The open wire design exerts less force on the eyelids so there is theoretically less risk of post-operative ptosis or other eyelid malposition. As the amount of force can be easily adjusted for the upper and lower retractor separately, it can be used to retract delicate tissues such as the skin, orbicularis, and preaponeurotic fat during levator advancement or recession. 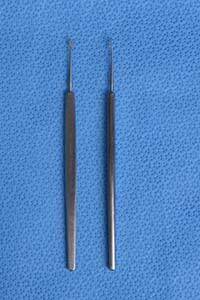 These are our preferred lid retractors and are commonly used when performing upper eyelid surgery and enucleations or other oculoplastic surgeries involving the globe. 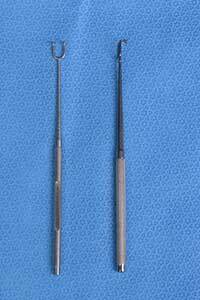 This is a multipurpose tool used in many procedures, commonly to elevate the periosteum from bone in confined spaces. It is double ended and typically has a rounded handle with two slightly curved, tear-drop shaped tips. One tip is blunt while the other is sharp. The curvature of the tips allows for the navigation of contours, such as when elevating the periosteum during repair of orbital floor fractures. 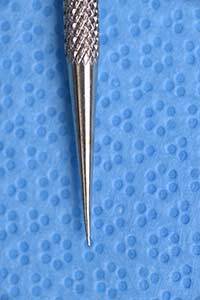 Baron Ear Suction Tip 5Fr 5.125"
This is small sized suction tip is used to provide suction within narrow spaces (originally designed for use in the ear). The suction is controlled by covering the small opening located on the thumb plate proximal to the handle. 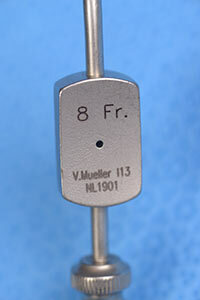 The size of the suction tube is indicated by the French measurement scale (three times the diameter in millimeters). The instrument is angled slightly to avoid obstructing the view of the area being suctioned by the surgeon's hand. 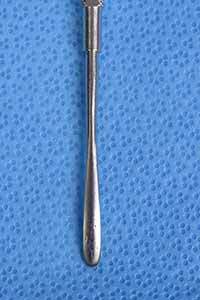 This suction tip is used during orbital dissection where space does not allow for the use of a larger suction tip. Unlike with the Frazier, there is no stylet for this suction. 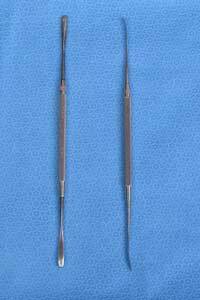 Castroviejo Double Ended Lacrimal Dilator Straight 5.5"
Ziegler Double Ended Lacrimal Dilator Curved 5.125"
This is a double-ended instrument that is most commonly used in lacrimal system procedures. 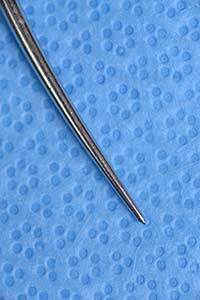 The dilator is used to help enlarge the puncta and canaliculus for punctal or canalicular procedures such as probing, stenting, punctal plug placement, punctoplasty, or marsupialization of the canaliculus. 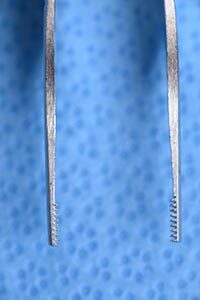 These dilators serve a purpose identical to those of the Castroviejo dilators described above but are curved instead of straight. The curve aids in passage of the dilator through the punctum into the canaliculus. Bowman Probes (Sizes 0000-000, 00-0, 1-2, 3-4, 5-6, & 7-8) 5.75"
These probes may be used to detect obstruction or laceration of the nasolacrimal system. They are also used to lyse stenotic membranes within the nasolacrimal system. 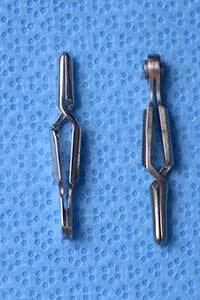 Also known as "bulldog clamps," these are commonly used in oculoplastics to secure suture and prevent entangling with other suture as is done for the rectus muscle sutures in an enucleation. Kirkup J. Bard-Parker scalpels. Journal of medical biography 2005;13:206. 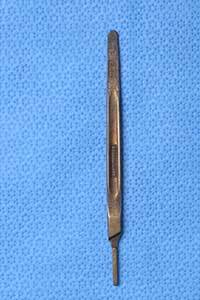 Ochsner J. Surgical knife. Texas Heart Institute journal 2009;36:441-3. El-Sedfy A, Chamberlain RS. 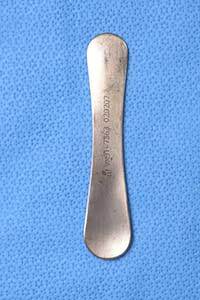 Surgeons and their tools: a history of surgical instruments and their innovators--part I: place the scissors on the Mayo stand. The American surgeon 2014;80:1089-92.